Buy tickets at least 14 days before travel. 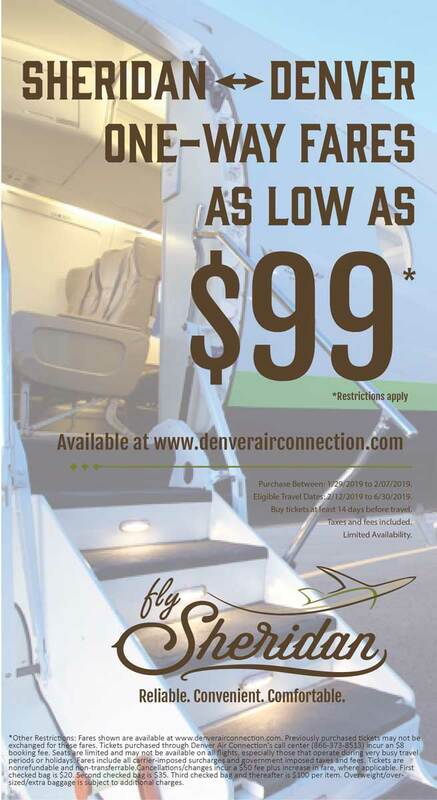 *Other Restrictions: Fares shown are available at www.denverairconnection.com. Previously purchased tickets may not be exchanged for these fares. Tickets purchased through Denver Air Connection’s call center (866-373-8513) incur an $8 booking fee. Seats are limited and may not be available on all flights, especially those that operate during very busy travel periods or holidays. Fares include all carrier-imposed surcharges and government imposed taxes and fees. Tickets are nonrefundable and non-transferrable. Cancellations/changes incur a $50 fee plus increase in fare, where applicable. First checked bag is $20. Second checked bag is $35. Third checked bag and thereafter is $100 per item. Overweight/oversized/extra baggage is subject to additional charges.